The Atlantic recently asked if all those rainbow profile photos were “another experiment.” A Facebook spokesperson responded to that question directly: “it’s not an experiment or test—everyone sees the same thing.” Facebook has conducted studies on profile pic memes like this in the past, but this is the first time that Facebook has built a tool for the expressed purpose of showing political support with a profile picture. That said, the Facebook spokesperson didn’t deny that the social network was tracking which users support gay marriage and adding that to the database of personal information the company has on its billion users. We’ve reached out to Facebook for further clarification. But at this point, it’s a pretty safe bet that Facebook is tracking everything you do on its social network. Zuckerberg and company has been keeping tabs on its users for years, from tracking their browser activity to using supercookies to keep tracking users even if they’ve deleted their accounts. What’s more, the last time there was a big profile picture protest for gay marriage, a Facebook data scientist quietly published an academic paper on the data that Facebook collected with the title “The Diffusion of Support in an Online Social Movement.” It’s not exactly beach reading, but it’s evidence that Facebook is paying close attention to how people use the social network to effect social and political change, as the Atlantic explains in more detail. 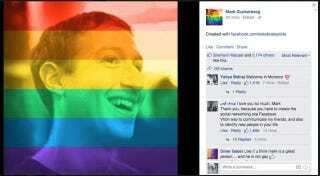 This is not to say that you shouldn’t give your Facebook profile the rainbow treatment. It’s a great way to celebrate a historic event. But don’t forget that, as always, Facebook is watching. This was not an experiment or test, but rather something that enables people to show their support of the LGBTQ community on Facebook. We aren’t going to use this as a way to target ads and the point of this tool is not to get information about people. Well, if it’s not the point of the tool, tracking users is fine right? Read the full story at the Atlantic here.